In October we have approval decisions for two obesity drugs: ARNA Lorqees and VVUS Qnexa (Oct. 22 and Oct. 28 accordingly). Why I have VVUS in portfolio? The reason is new VVUS 2 years results. Compare 2 year efficacy results for both drugs. So, obviously that Qnexa is at least 2 times stronger than Lorcaserin. Both drugs were rejected by FDA panel because of safety and side effects. And some panelists asked about 2 years safety for Qnexa. Now we know that "treatment-emergent serious adverse event rates in SEQUEL were low (top-dose = 4.1%; mid-dose = 2.6%) and similar to placebo (4.0%), with no drug-related serious adverse events reported." In case of "panel of outside advisers to the FDA voted against recommending the drug for approval, citing concerns about tumors seen in rats in early-stage testing of the drug. … Of particular concern was the increase of mammary tumors in rats treated with lorcaserin". So, Qnexa side effect such as headaches, mouth dryness, sleep disorder, tingling, diarrhea, etc. Other common side effects from Qnexa include a sensation of prickling in the skin and constipation. The combination treatment seems to have less cognitive side effects and lower discontinuation rates than topiramate alone. Now several law firms are suing ARNA. "According to the complaint, after investors began to learn the truth about lorcaserin on September 14, 2010 when the FDA disclosed a Briefing Document titled NDA 22529 Lorqess (lorcaserin hydrochloride) Tablets, 10 mg Sponsor: Arena Pharmaceuticals Advisory Committee - September 16, 2010, which revealed, among other things, that lorcaserin caused cancer in rats in certain preclinical studies, the value of Arena's shares significantly declined. The defendants allegedly touted Lorcaserin’s purported efficacy, safety, and tolerability but failed to disclose certain health risks associated with the drug. On September 14, 2010, the Food and Drug Administration (“FDA”) issued a briefing document in advance of its advisory panel meeting that questioned the safety and efficacy of Lorcaserin and revealed, among other things, that the drug was associated with malignant tumors in rats. The complaints allege that throughout the Class Period, defendants made materially false statements regarding Lorcaserin. Specifically, during the Class Period"
Actually it's not truth. All documents containing the information about potential health risks associated with the Lorcaserin were always avaiable to biotech investors. It was enough to google 3 words: "Lorcaserin high doses" and read next document "BLOSSOM: Behavioral Modification and Lorcaserin Second Study for Obesity Management"
p.5 "Some rats given lorcaserin at very high doses for 6 months or up to a year or more developed tumors of the breast in an ongoing two year study. Breast tumors occur commonly in rats that receive certain drugs that act on the brain. This finding is thought to be limited to rats and of questionable importance for humans." So it was published information. Actually I find it long time before ARNA crash and even tried to discuss it on ARNA message board. I mentioned that breast cancer will be serious concern for panelists. Panelists were just "spooked" by the rat study tumor results. Actually only one panelist said it honestly ("[FDA panelist] Edward Gregg, chief of epidemiology and statistics in the Centers for Disease Control and Prevention's Division of Diabetes Translation, said he was "spooked" by the rat study tumor results."" After voting Arena CEO Jack Lief that it was a “shame” there were no experts in carcinogenesis or toxicology on the panel. "My view is they were having difficulty understanding the presentation," he said. It was really shame but shame for Arena R&D and management. Because they knew about potential cancer issues and they must present data that will persuade the panel that this high doses cancer effect is "limited to rats and rats only and of questionable importance for humans". Arena said that "Lorcaserin was investigated in a standard battery of genotoxicity, reproductive toxicity, general toxicity, and carcinogenicity studies. Lorcaserin showed no reproductive toxicity or genotoxicity. General toxicity studies were conducted in mice, rats, and monkeys at doses that produced very high exposure multiples relative to the human maximum recommended dose (MRD). In repeated dose Good Laboratory Practice (GLP) toxicity studies, lorcaserin was generally well tolerated at doses below the maximum tolerated dose (MTD) in all three species and there appeared to be no adverse findings of direct relevance to humans at therapeutic doses. Two-year carcinogenicity studies were conducted in mice and rats. There was no evidence of carcinogenicity in mice.In rats, and almost exclusively male rats, tumors were found in multiple organs primarily at the highest dose, which provided an exposure that was 56-fold greater than human and was clearly above the MTD. Sure that Arena scientists performed tens of high-cost experiments and showed that lorcaserin is not mutagenic (Ames test) and not a DNA damaging agent (Comet assay). So, high doses of lorcaserin induces this cancer in rats by different mechanisms than mutagenic or cancerogenic. Good explanations you can find here (http://seekingalpha.com/instablog/398853-james-hill-md/94978-fda-panel-flubbed-in-arenas-lorcaserin-disapproval). So, ARNA management knew about cancer in rats and did nothing to prove that "this finding is thought to be limited to rats". They presented these data to FDA panelist and blame them that "they were having difficulty understanding the presentation" and that panelists are not "experts in carcinogenesis or toxicology". FDA panelists were just "spooked" by word cancer. But who will not be spooked? But Lorcaserin high doses cancer in rats could be really an artifact. "Professor Ames’ opinion is that cancer tests using animals give a misleading picture. Feeding animals extremely high doses of substances, which is the normal procedure, can cause chronic cell death simply because of a localized overload, for example of the stomach. Cancer develops only because of the high dosages administered, which means that the studies say nothing about the substance’s actual capability of causing cancer in human subjects at the exceedingly lower levels to which humans are exposed. An enormously high proportion of all the substances in the world would probably prove cancer-inducing with animal studies, which clearly indicates that these tests are measuring not carcinogenicity, but something completely different, localized overloading"
Simple extrapolations, transferring test results of chemicals from the near-toxic dose in rodents to the low-level exposure in humans, thus committing several fallacies at the same time, i.e. ignoring species differences as well as dose discrepancies, has led to exaggerated cancer risk estimates, an imbalance in the perception of hazard, and finally a wrong allocation of resources. So, ARNA R&D knew that cancer in rats can be an artifact and did nothing to prove that it is artifact. How to prove that in case of lorcaserin rat model may produce an artifact cancer? In case of lorcaserin "there was no evidence of carcinogenicity in mice. In rats, and almost exclusively male rats, tumors were found in multiple organs primarily at the highest dose. "FDA accepts two-year carcinogenicity studies in two animal models: rats and mice. But they (ARNA) could to perform another alternative carcinogenicity study. Again in mice but transgenic mice with the p53 knockout or Tg.rasH2 mice. "As part of the regulatory approval process, new drugs have to be tested for their carcinogenic potential. For several decades, the two-year rodent bioassay in rats and mice has been an integral part of safety testing for the carcinogenic potential of pharmaceutical agents. Unfortunately, the two-year conventional rodent bioassay is long, expensive and frequently provides ambiguous results for human risk assessment. These limitations led to the creation of transgenic animal models, which carry genetic constructs specially designed to enhance the detection of carcinogens. The three most widely used strains of transgenic mice are the p53 knockout, the Tg.AC and the Tg.rasH2 mice. The ICH (S1B) and EMEA (CPMP/SWP/2592/02) guidelines state that the carcinogenic potential of pharmaceuticals can be evaluated from data collected from one long-term conventional rat study, as well as from data from one short-term carcinogenicity study using transgenic animals. The US FDA (CAC) recommends the use of the rasH2 mouse for non-dermal, genotoxic or non-genotoxic drugs, the p53 for non-dermal, genotoxic drugs and the Tg.AC for dermal drugs. In simple words: if you see cancer in conventional rat model but conventional mice model show no evidence of carcinogenicity of lorcaserin in mice just test this drug in FDA recommended rasH2 mice. "Given the potential for lorcaserin to be used by hundreds of thousands of women once it enters the U.S. market, "there is just too much uncertainty" without more studies to answer the tumor question, said [FDA] panelist Jacqueline Gardner, a professor of pharmacy at the University of Washington." But if Arena present data showing that lorcaserin is not carcinogenic in alternative transgenic mice model sure that this data will convince FDA panelists that lorcaserin-induced rat cancer is artifact. By the way the carcinogenicity studies in transgenic mice take 26 weeks. And I don't understand why Arena's R&D didn't do this study in transgenic mice model. Conclusion: definitely US needs effective obese drug and doctors will prescribe it if it effective and safe drug. Some people are very critical about obese drugs and mumbling about sport and exercise. I am strongly disagree with them. Everybody can become overweight and it happens very slowly. At some level of extra-pounds many people decided to stop it but it's very difficultly. So, I'm positive for obese drugs only if they will be used to help obese people to make a first step to normal bodyweight. Likely nicotine candies help smokers to quite. I think that Qnexa medium dose is enough effective and safe drug for obesity. So, some enough high probability exists that FDA will approve Qnexa medium doses without additional safety trial. Arena's lorcaserin (or Lorqees) is much less effective than Qnexa and cancer uncertainty will not allow FDA to approve it now. But FDA may ask in CRL about additional animal carcinogenic study (transgenic mice?). May be it will take another year to prove that lorcaserin is safe. Disclosure: will have VVUS in portfolio through PDUFA. I changed ARNA from short to neutral. If FDA will ask about animal studies I will include ARNA in potential investment watch list. Correction: sold VVUS because of too high risk. FDA is overcritical about safety now, so the probability of CRL asking about additional safety data is very high for VVUS. "Missed money is better than lost money"
"The CRL included the following requests related to the non-clinical issues: provide a detailed accounting of all slides prepared from female rats that contributed to mammary tumor incidence data in each update to the FDA and to the final study report; in consultation with the FDA, identify an independent pathologist or group of pathologists to re-adjudicate all mammary and lung tissues (neoplastic and non=neoplastic lesions) from all female rats; demonstrate that the apparent increase in aggressiveness of adenocarcinoma in rats administered lorcaserin is reasonably irrelevant to human risk assessment; and provide additional data/information regarding the distribution of lorcaserin to the CNS in animals and human subjects that would clarify or provide a better estimate of astrocytoma exposure margins. With respect to the clinical reasons, the FDA stated in the CRL that the weight loss efficacy of lorcaserin in overweight and obese individuals without type 2 diabetes is marginal and recommended that Arena submit the final study report of the BLOOM-DM (Behavioral modification and Lorcaserin for Overweight and Obesity Management in Diabetes Mellitus) trial. The FDA also stated in the letter that in the event evidence cannot be provided to alleviate concern regarding clinical relevance of the tumor findings in rats, additional clinical studies may be required to obtain a more robust assessment of lorcaserin's benefit-risk profile." Since BLOOM-DM is completed and Arena expects to announce top-line results in the next few weeks and to have a completed study report by the end of the year. And it seems like that FDA didn't ask ARNA to repeat all animal cancer studies (will take at least 2 years) but only "provide a detailed accounting of all slides prepared from female rats that contributed to mammary tumor incidence data". If it's true it's very good news for ARNA. "Additionally, the FDA stated in the CRL that it would recommend placement of lorcaserin in Schedule IV of the Controlled Substance Act based on its review of the materials submitted in the NDA." (C) Abuse of the drug or other substance may lead to limited physical dependence or psychological dependence relative to the drugs or other substances in schedule III." Control measures are similar to Schedule III. Prescriptions for Schedule IV drugs may be refilled up to five times within a six month period. Drugs in this schedule include: Benzodiazepines, such as alprazolam (Xanax), chlordiazepoxide (Librium), clonazepam (Klonopin), diazepam (Valium), temazepam (Restoril) (Note that some states require specially coded prescriptions for temazepam) flunitrazepam (Rohypnol) (Note that flunitrazepam is not used medically in the United States); The benzodiazepine-like "Z-drugs": Zolpidem (Ambien), Zopiclone, Eszopiclone, and Zaleplon; * Dextropropoxyphene (Doloxene) and propoxyphene (sold in the U.S. as Darvon, and in combination with acetaminophen as Darvocet); * Long-acting barbiturates such as phenobarbital; Some partial agonist opioid analgesics, such as pentazocine (Talwin); The stimulant-like drug modafinil (sold in the U.S. as Provigil) as well as its (R)-enantiomer armodafinil (sold in the U.S. as Nuvigil). Well, if finally Lorqess get an approval it will be a prescription drug with moderate control. So, finally these news are not so bad. ARNA's Lorqess has enough high probability for resubmission in late 2011 or early 2012. Will include ARNA in Cold Watch List. So, VVUS Qnexa won FDA panel vote (20:2 is a real victory). Will be ARNA a next winner in obesity race? Last time panelists were spooked only by "rat tumor". Was it resolved by ARNA? SAN DIEGO and WOODCLIFF LAKE, N.J.,Aug. 9, 2011 /PRNewswire/ -- Arena Pharmaceuticals, Inc. (NASDAQ: ARNA) and Eisai Inc. announced today results from a Pathology Working Group's (PWG) re-adjudication of female rat mammary tumor diagnoses from a two-year rat carcinogenicity study of lorcaserin. Arena convened the PWG in response to the lorcaserin Complete Response Letter (CRL), which questioned the certainty of the female rat mammary tumor classifications. The PWG reviewed relevant tissues and reported that mammary fibroadenomas (benign tumors) were distinguishable from mammary adenocarcinomas (malignant tumors). The PWG reported shifts in the numbers of both tumor types from the initial report included in the lorcaserin New Drug Application (NDA) and that adenocarcinomas were no longer numerically higher than the control group in the lorcaserin low- and mid-dose groups. One of the FDA's requests is that we demonstrate the mechanism for mammary tumors in female rats that is reasonably irrelevant to human risk. Our working hypothesis is that Lorcaserin causes mammary tumors in rats by increasing prolactin affect on the mammary gland. The FDA has suggested several experimental approaches to test the prolactin hypothesis, including measuring circulating prolactin in rats dosed with Lorcaserin and examining mammary tissue for evidence of prolactin hyper stimulation. The FDA has recommended a dosing duration of no less than 3 months with interim measures to establish a causal relationship between Lorcaserin, prolactin and mammary tumor development in rats. The FDA has also asked that we consider a 12 month study in female rats that would test if the transient prolactin elevation mediated by short term exposure by Lorcaserin can lead to mammary tumors. Based on our communications with the FDA we plan to conduct several experiments to test our hypothesis. We will evaluate data as they become available and we believe that if the experiments of 3 months and shorter duration demonstrate convincing evidence of prolactin elevation and or prolactin hyper-stimulation that we could have sufficient evidence to support the prolactin hypothesis. If the results of these studies are inconclusive additional studies may be required to better characterize the role of prolactin in rat mammary tumor pathogenesis or to find an alternative mechanism. We have submitted protocols for the prolactin studies for 3 month annd shorter duration and are awaiting the FDA's feedback. To mitigate against the possibility that the data from these studies may be insufficient, we and Eisai are considering a 12 month study. We intend to finalize our plans after we receive the FDA's feedback on the protocols for the studies of 3 months or shorter duration. In addition the re-adjudication of mammary masses, the clinical trial to collect cerebral spinal fluid and the further assessment of receptor pharmacology and abuse liability are ongoing or are about to commence. Our goal is to resubmit our NDA to the FDA by the end of this year. Depending on the results of ongoing and planned activities and any new guidance or feedback that we receive from the FDA, we may be able to meet this goal. We and Eisai are fully committed to a thorough and detailed resubmission." Arena Pharmaceuticals has submitted its response to the U.S. FDA regarding the regulator’s concerns about the experimental weight loss drug lorcaserin. "The company said that the new analyses indicated rats did not develop tumors when received a dose of lorcaserin 24 times higher than that recommended for human use. To further convince the regulators, the companies have shown that the mechanism for tumor formation was relevant to rats but not humans, which involved the increased levels of prolactin, a hormone that associated with mammary tumors in rats “but is not known to cause mammary tumors in people”. The company said it tested ways of blocking prolactin and found it was able at least partially prevent lorcaserin-related changes in the mammary gland. Christy Anderson, head of Arena’s lorcaserin development program, said,”with these last group of experiments, which had to do with mammary tumors in female rats, we believe that we have addressed all of the issues that the FDA raised in the complete response letter”. “We have worked diligently with Eisai to prepare this submission that we believe will address the issues raised in the CRL,” said Jack Lief, Arena chief executive officer. In clinical trials of some 7,000 patients taking lorcaserin for up to two years there was “no excess of any sort of tumors in humans,” Lief added. To answer FDA’s query about the serotonin receptor subtypes, Arena said itscell-culture experiments confirmed lorcaserin has greater potency at one of the serotonin receptor subtypes than two others. However, the company stressed cautiously that the U.S. agency “may analyse or weigh the data differently than Arena and Eisai”. Well, it's good enough for me now. I mean both the results and ARNA pps to enter ($1.86 now). Conclusions: I don't have ARNA positions now but may buy it any time. "The FDA has accepted the resubmission for filing and review, assigned a new Prescription Drug User Fee Act, or PDUFA, target date of June 27, 2012, and notified Arena that an Endocrinologic and Metabolic Drugs Advisory Committee meeting to discuss the resubmission is tentatively scheduled on May 10, 2012. The resubmission includes data and analyses that were not incorporated in the original NDA, including the results of the Phase 3 BLOOM-DM (Behavioral modification and Lorcaserin for Overweight and Obesity Management in Diabetes Mellitus) clinical trial, which evaluated lorcaserin for weight loss in patients with type 2 diabetes and was completed after Arena filed the original NDA. The new information also includes data and analyses from activities intended to address tumors observed in a two-year lorcaserin rat carcinogenicity study, as well as cell culture experiments intended to further refine serotonin subtype 2 receptor activity and rat studies designed to further assess abuse potential." Lorcaserin is less effective than Qnexa (at least 1.5 times). But it has a different mechanisms of action so doctors can prescribe LS to patients that are resistant to Qnexa (or become resistant after 1-2 years). Last time panelists were spooked by rat tumor now they will see that it was just "rat tumor" induced by the enormous LS doses. LS 1 year data is good enough for approval. "At December 31, 2011, cash and cash equivalents totaled $57.6 million and approximately 146.1 million shares of common stock were outstanding. In January 2012, Arena received net proceeds of approximately $27.9 million from its equity financing with certain Deerfield entities, after principal prepayment of $5.0 million on its Deerfield loan. In March 2012, Arena received net proceeds of approximately $24.7 million under an equity line of credit with Azimuth Opportunity, L.P. After such financings, on March 14, 2012, approximately 180.4 million shares of common stock were outstanding." So, they will not do a dilution right now but it's possible after positive panel vote (the probability > 70%). When to buy ARNA? May be right now at $1.80 pps. 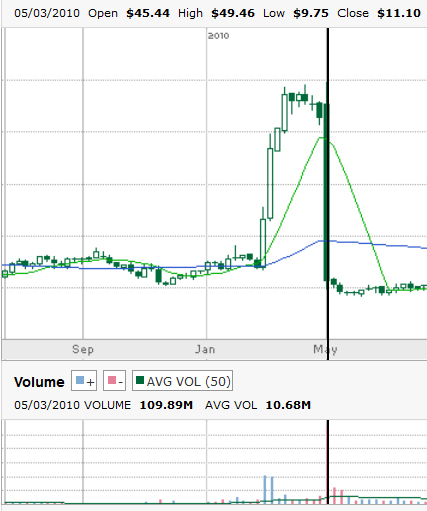 Pps goes up starting from December 2011 and volume say that funds are accumulating ARNA. Disclosure: I don't have ARNA now but will buy it tomorrow. I bought VVUS (and still have it) but I'll be just a bystander at ARNA. I read all FDA documents and think that panelists will vote negatively. Lorcaserin is not so effective as Qnexa and it induces these Prolactin spikes in patients (may provoke a breast cancer). And most important reason: with Qnexa panel was under pressure - USA needs effective obesity drug. Now fate of Qnexa in FDA hands and if panelist will vote negatively for lorcaserin (marginal efficacy and potential inducer of breast cancer reasons) he will not become the "enemy of all fat people of USA". Disclosure: I don't have ARNA and will not buy it today. Well, I wasn't right last time: panel voted for ARNA. But it seems like that most panelist just "wash their hands" i.e. they let FDA to kill lorcaserin with another CRL. Qnexa is combination of 2 approved drugs and it's very effective for obesity treatment. But lorcaserin is a new entity with unknown side effects in big patient population. Also remember that panel vote is not so important for FDA. Just one example: ITMN drug Pirfenidone, a treatment for IPF. Panel voted positively for Pirfenidone because it was no any treatment for IPF (deadly disease when people are dying by slow suffocation) but FDA rejected the drug and asked about another phase III trial. It was low calorie diet for patients that participated in trial so placebo results were also strong. Any way good luck for all brave investors that bought ARNA at $10 and will still keep it through PDUFA. ITMN pps drop >75% in one blink of eye (not below because they had enough money). So, FDA rejected drug for doomed IPF patients after positive panel vote because of low efficacy (it's actually true) and now FDA will approve new but very low efficacy drug with unknown side effect for obesity that is 100 times less dangerous than IPF? ARNA pps is >$8.15 today and it means that we have the "investomadness" case here. Very good opportunity to short this stock at highest point (may be even $10). FDA has a alternative and very effective drug for obesity on the table now - Qnexa. They took 3 additional months to review Qnexa but not lorcaserin. If Qnexa have some troubles in the future FDA will always say that they approved safest obesity drug i.e. combination of 2 old drugs that are already on market. The potential birth defects of Qnexa is known for doctors and they will notify all patients about it. But if lorcaserin cause some problems (heart, cancer and etc.) - FDA will be under fire. In April 10, 2012 FDA extended its review of Qnexa (phentermine/topiramate) by three months to July 17 to give the agency more time to examine the company's latest submission. Everybody hopes that FDA will do it for ARNA lorcaserin and it will be a good sign for ARNA. FDA panel voted 20-2 in favor of approval for the Qnexa. FDA advisory committee voted 18-4, with one abstention, that the agency should approve lorcaserin. "there is still a lingering uncertainty" about the connection between lorcaserin and heart valve disease, said panelist Sanjay Kaul, MD, a UCLA cardiology professor who voted against approving the drug. ''Given the totality of evidence, the potential benefits of [the drug] do not outweigh the potential risks." I think that the probability of CRL for ARNA obesity drug is >80%. FDA most likely will ask about one more safety trial to avoid heart valve problems in big patients population. Disclosure: I don't have ARNA now but will short it at high in next several days. Just one more lesson for us: nobody can predict pps level if it's driven by "investomadness". ARNA already passed $12 today and continue to climb to $13-15 level before PDUFA. It was no FDA delay and it's too late for it. There is only 1 variant why: already after panel FDA knew that they will send CRL to ARNA. How to explain this crazy pps growth? May be simple explanation: funds that kept >70M shares decided to sell it at high and initiated the game "russian roulette": increasing price each day is likely adding one more round to the cylinder i.e. the buyers at high price have very little probability to survive. Starting from today there only 2 more rounds to insert so in June 27 all buyers are practically self-murderers. They could be small funds and institutions and also a millions small investors. Questions how funds designed and build this amazing hyperbolic chart? Trade machines helped them: they are always buying such crazy growing stocks, calculate and approximate future pps and keep buying and keep. They never ask the questions why this stock is growing like crazy and what is the probability of crash. The main principle is here: keep it growing and you always will have many buyers (mostly trade machines). It's machine world now. But funds have the investors money to play. They don't care about losses. It's a main reason why I never give my money to any funds: they don't have a fear to lose them. We (individual investors) have this fear and it stimulates us to think and analyze all companies before buying them. So, now everybody including Cramer are saying "yes, buy ARNA"
So, today (06/22/2012) is a last day to avoid the self-murdering via keeping and buying ARNA at high. Disclosure: I have short ARNA positions and may be will add July puts (8-9 strike). Tomorrow is a last day before we know what FDA thinks about Lorcaserin. If FDA approve it we will know that FDA changed their politics "efficacy + safety only" to "some efficacy + may be it will be safe, we will see...". Will FDA allow to pharma companies use American citizens as guinea pigs? It's very unlikely. They VVUS obesity drug as a backup: very effective but with strong REMS. So, we will see tomorrow how FDA will stand the pressure of Wall street that said >70% probability of approval. Disclosure: I have 10k ARNA shorted at $9.40 and 200 contracts puts at strike 7.